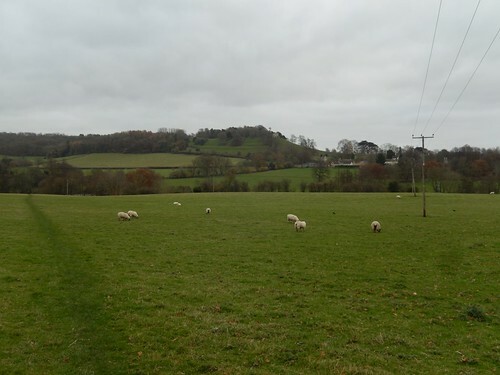 One day after following a Walk West route in Somerset, I decided to embark on another walk from the free eBooks, beginning further north in Gloucestershire. 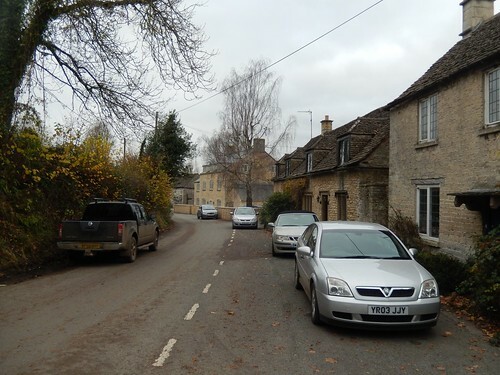 It began in the village of Tresham, where I found a paved layby at the side of a quiet country road. My car was almost perfectly perched at the head of a valley and I had good views of the landscape I’d be following towards the walk’s end. From the moment I left my car, I became very uncertain of the way forward… Along with the obvious waymark from the road, the guide was indicating that I should walk up a private driveway. 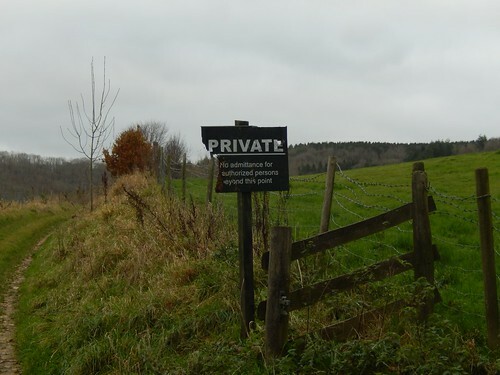 Ahead, I saw a private sign. To my right, another private driveway. There was no such restriction across the house to my left but, if there was a sign, it might’ve been obscured behind the row of cars. 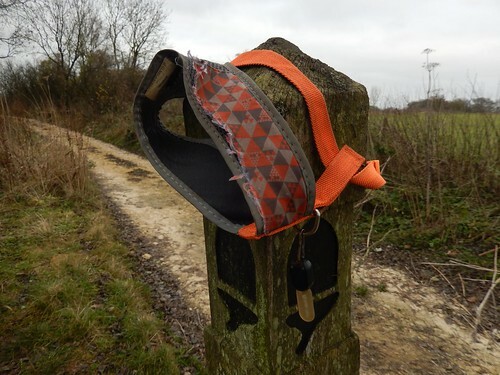 Eventually, I retreated to the road and walked deeper in to the village (less than a hundred yards), before taking an alternative right-turn opposite a phone box, now following a byway towards a farm yard. 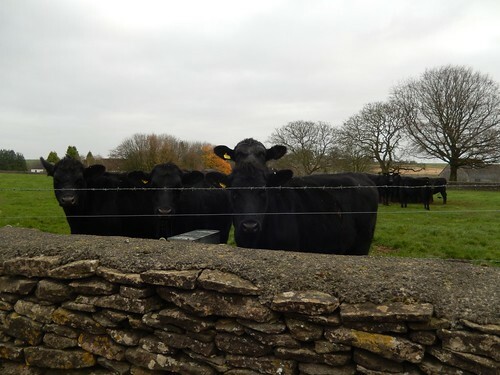 I was soon grateful to have missed the other route because it would’ve taken me straight through a field with ‘curious’ black cows! 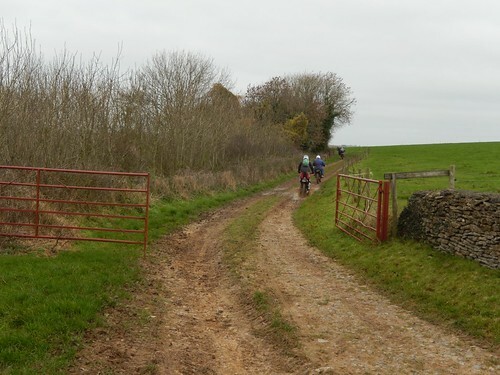 Following the drive away from Tresham Farm, I stopped at a bend to step aside and give way to a stream of off-road bikers… These drivers were probably in their teens and seemed slightly cocky. 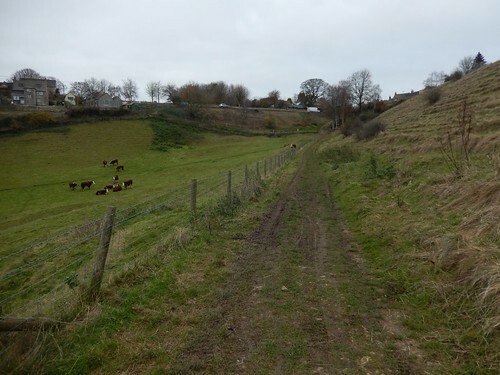 I’m sure they’re legally permitted to follow public byways but, as I soon left this track to descend towards the valley bottom, I could still hear them roaring in the distance… I wondered whether they were churning up a field and, more importantly, whether they had permission? 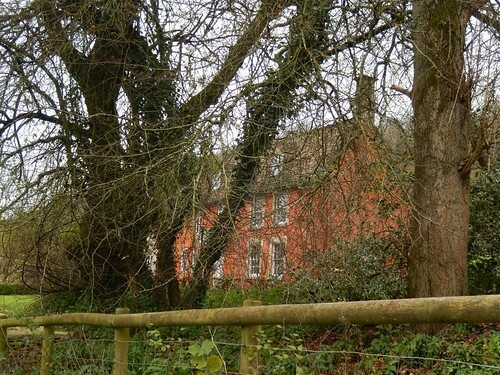 At the bottom of a wet and rocky path, I reached Holwell Farm. No yard as such and the waymarking was clear. 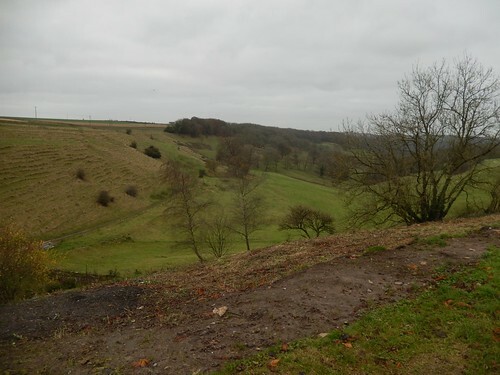 This area is known as Ozelworth Bottom. In the field to my side, I could see signs that winter had taken over. 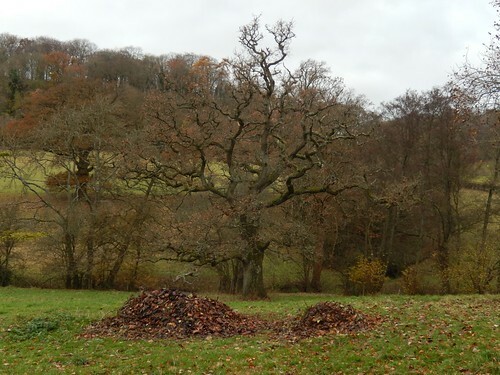 However, I find it hard to imagine that nature could’ve piled the dead leaves up so neatly. 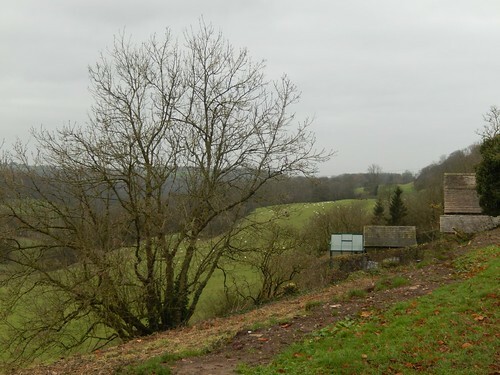 From Brook Cottage, I would climb the hillside ahead. It was unforgivingly steep. But perhaps not unexpected, as I had already lost a lot of height from the start of this walk. 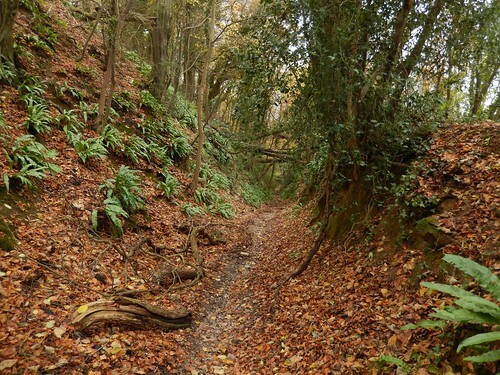 Higher up and the tracks were both wide and easy to follow, skirting several areas of woodland. I also found a hat that I think would’ve belonged to a horse rider. I climbed higher still, with no other soul to be seen or heard. 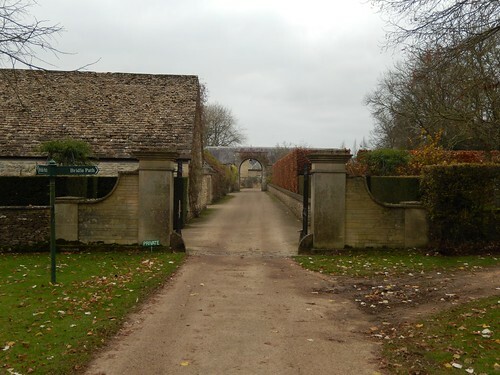 Another driveway would lead me to the private walled entrance of Ozelworth Park… Suddenly, things were beginning to look familiar. This bridle path led me up and around the estate; squeezed between the gardens and a pond, with only a tall hedge for company. 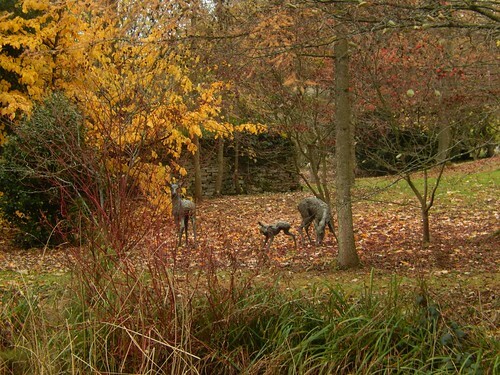 Across the pond, I could see deer (not real ones) and a bench off to their right. I think there was even an open gazebo. All of which, I presumed, must be private. As tempted as I was to sit down, having recently regained so much height. 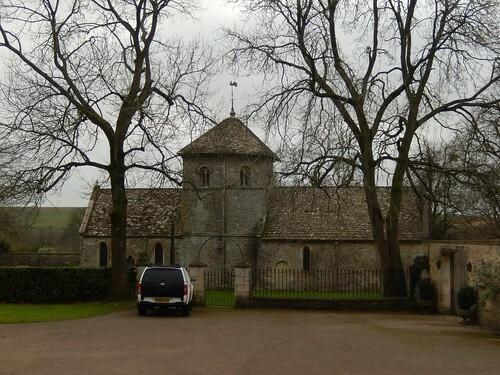 Just around the corner from here, I had found Ozelworth Church – although the other footpaths had been new to me, I’d definitely visited the church before. I think it was in January of this year. I decided to leave the church alone, this time and continued further along the road before pausing close to Fernley Farm. 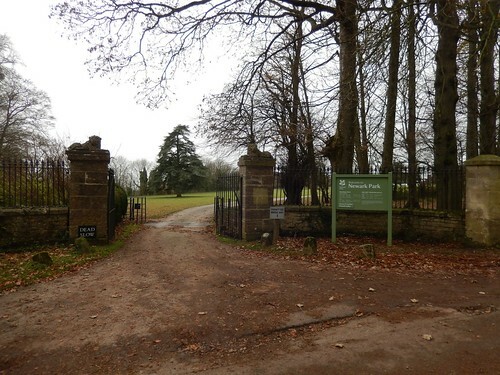 Feeling slightly refreshed and further on, I came to the entrance to Newark Park, which is owned by the National Trust. This was also familiar to me, because I walked past here on yet another walk back in February. Only, this time, with no-one else to take the lead, I followed the main drive (which is also a permissive bridleway) down towards the house. But, of course. Like most National Trust properties at this time of year, it was closed. I’d only missed it by a matter of days but there was no indication of a café or tea shop, either. 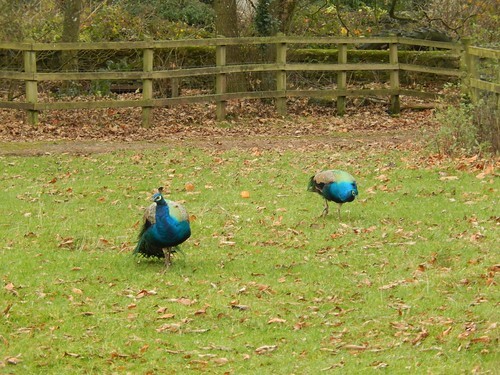 There were peacocks to my left and, following the bridleway from here, I soon passed portaloo-style toilet blocks beside the car park… Which was still very much in use, I might add. There were half-a-dozen cars present and, presumably, all dog walkers. 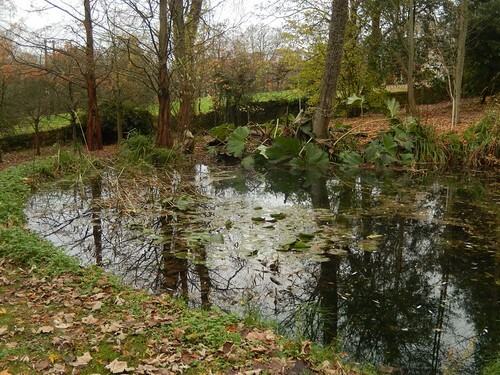 It may also provide a convenient base from which a group of walkers could set off. 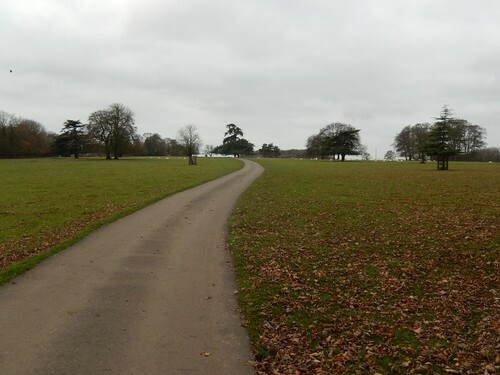 In an elongated U-formation, this path-that-isn’t-a-footpath leads back to the same road but only slightly further along. I held no regrets over the minor diversion. 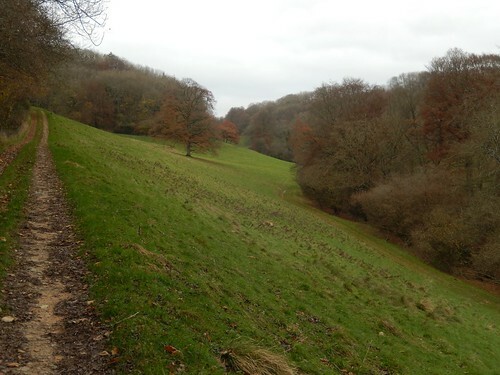 Soon, I joined the Cotswold Way for the first time in weeks, if not months. 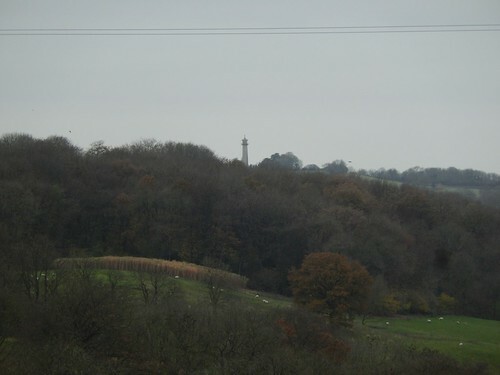 On the horizon, you can see the North Nibley Monument tower (Tyndale Monument). 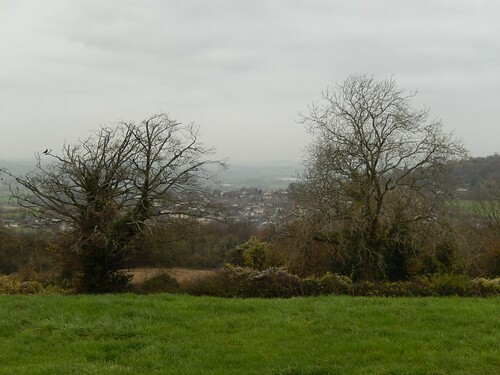 Suddenly, I was out in the open and overlooking Wotton-Under-Edge; following the path along the top of Tor Hill. 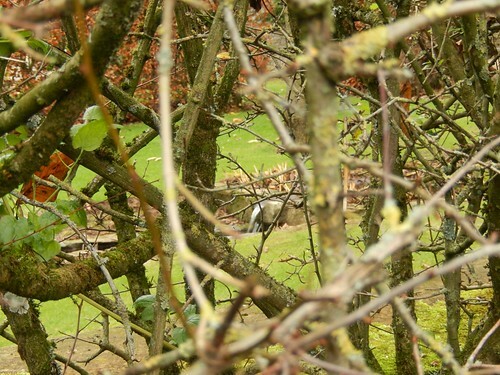 There’s a bench, here, put in place by the Cotswold Wardens. But I gave up my seat with a family of four heading towards me from the opposite direction. My lunch break would have to wait, just a little longer. 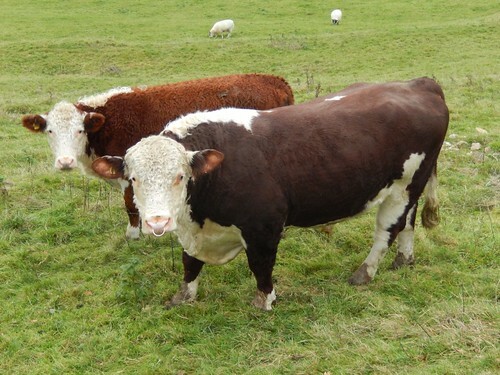 Had it really been that cold in the Cotswolds? Bearing in mind, that this was weeks before any frost would form. Through the woods, this path began to descend ever more steeply. Erosion has forced the route to narrow over time. Two people I passed suggested it was a challenging climb to the top. I was trying no to slip on any of the wet rocks under foot. At the bottom, I joined another track with no uncertainties over which way I would now go. 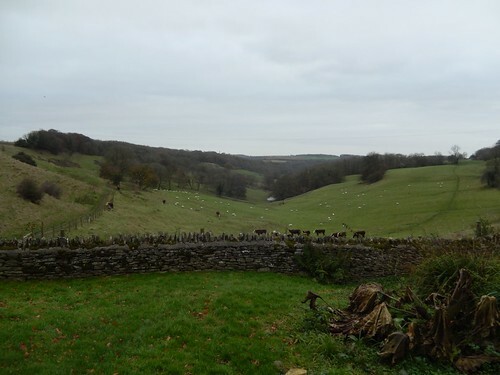 From Wortley, the Cotswold Way descends gently across open pasture. See, it’s not always about hills, in the Cotswolds. 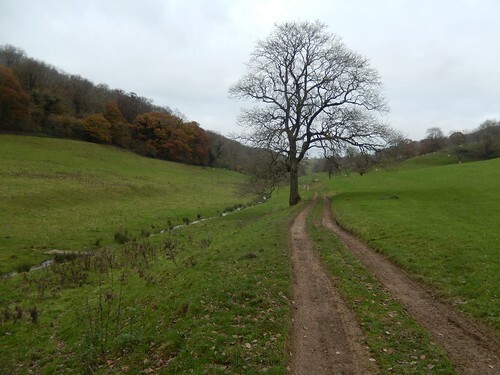 I hope that, sometime in the second half of 2017, I may get to walk the Cotswold Way in full… We’ll see. A gentle ascent led me to the village of Alderley. 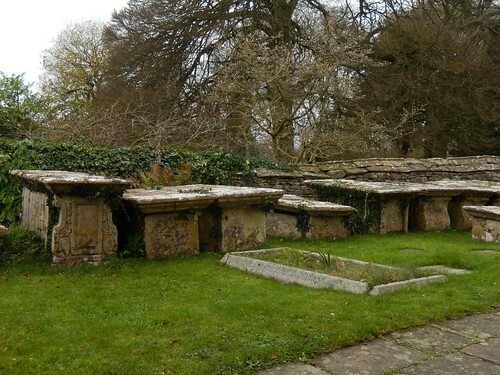 Instead of ploughing along the National Trail and to the end of my walk, I sought refuge in the churchyard; finding a place to sit and eat my sandwiches. 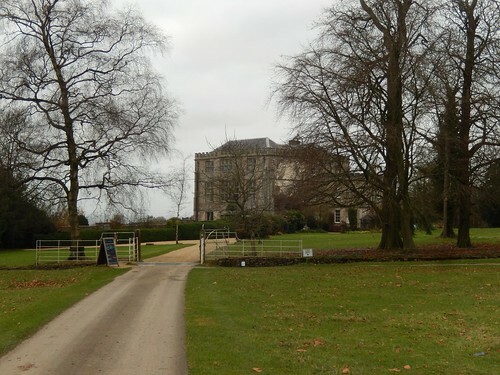 Beside the church was the grand manor of Rose Hill School. Some of the tombstones in the yard here were a spectacle in their own right. 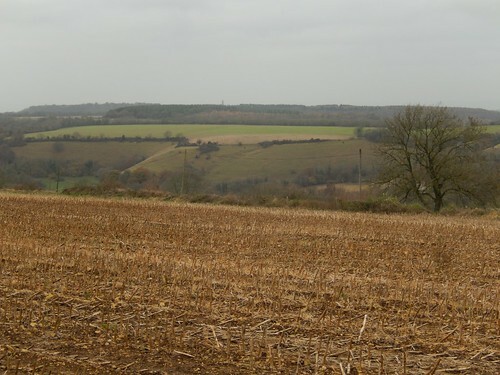 Returning to the Cotswold Way after lunch, I could almost see Tresham at the far end of the valley. 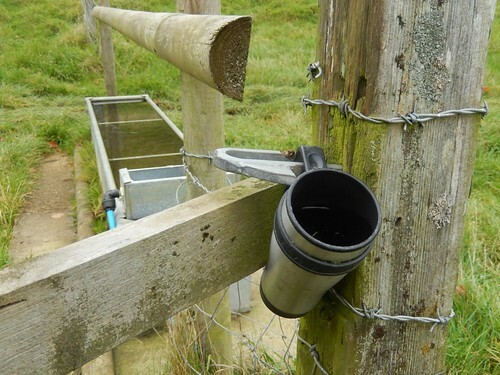 Beside one gate, someone had kindly (or not) left a flask close to a trough filled with sheep’s water… Even with a water filter, I’d have to think twice! 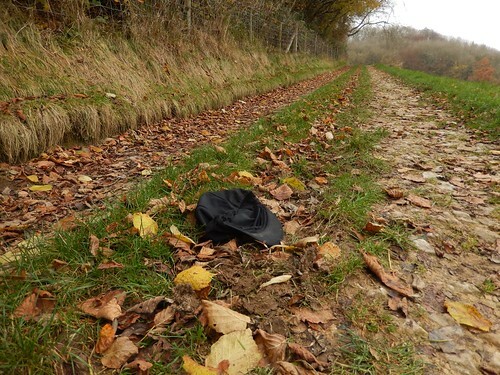 But it’s funny how we encounter discarded objects, sometimes. 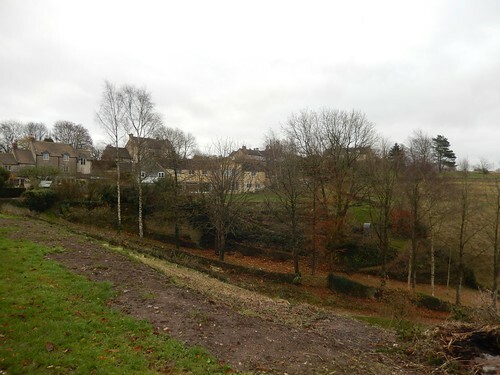 Further on and I said goodbye to the Cotswold Way near Kilcott Mill. Now, I would follow the Monarch’s Way en route to my car. 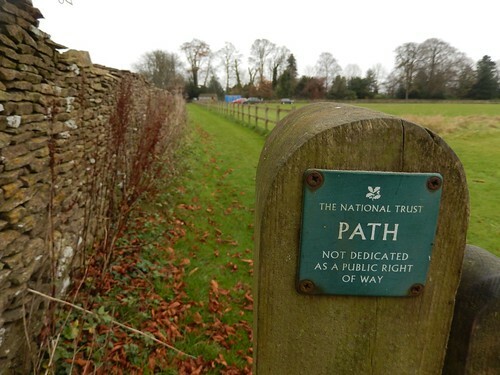 From a wet lane, the path developed in to a countryside track. From there, in began to climb, with the gradient increasing every hundred yards or so… Don’t worry, those bulls were in the field to my left. It was a near-exhausting end to an enjoyable walk. 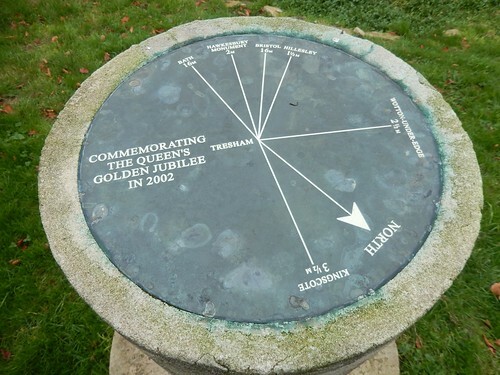 Before one final ascent of the hillside ahead of my car, I found this topograph in the Millennium Garden – quite possibly, one of the most sparsely-detailed that I have seen. I could almost say that I’ve visited half of the places name on here – but, I do now have the Hawkesbury Monument shortlisted for a future walk. 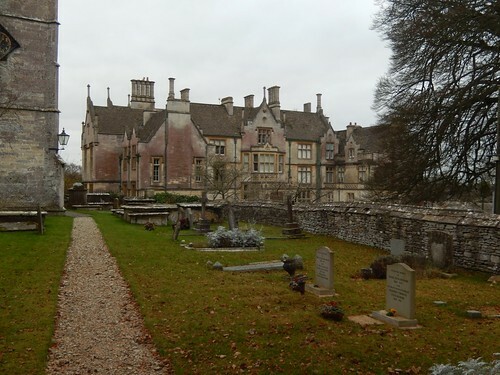 I talk about going to Wales, Dartmoor and spending more time walking in new places… But there is still a lot to Gloucestershire and the Cotswolds that I know I haven’t seen.